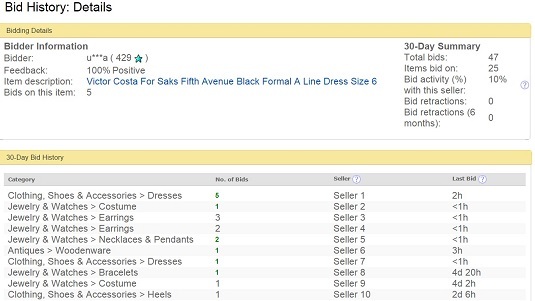 Researching your eBay competition can help you glean powerful information in an auction. It used to be an easy task to study up on your competition, but the brains at eBay got smart and made it all but impossible. That is, all but impossible to eBay users! But luckily, there is a circuitous route you can use to research your competition. Check it out. The anonymized ID of the person the item would belong to if the auction ended right now is listed on the auction item page. You can tell whether the auction has bidders because the number of bidders appears on the listing page. Easy little trick! Take a look at this ID because you may see this bidder again later in this auction. By clicking the ID, you are presented with a page like the one you see here, which shows just what that bidder has been up to — bidding-wise.